The “diet versus exercise” debate deals with the wrong question. Living well isn’t about choosing between eating right and exercising. It’s about taking one step at a time. If you’re going for weight loss, or slimming down, don’t overestimate exercise. Food and eating are much more powerful beginner tools in the hormone and metabolic shaping of your body and mind. Your body will respond immediately to good foods, especially healthy fats. I had six pack abs and under ten percent body fat all my adult life – and I still could see the explicit changes in how I looked, felt, and performed once I dropped the protein shakes, avoided wheat and sugar, and ate more fat. Timing of meals is ultra important. I’ve learned to not force food upon myself. If I’m not hungry, I’m not going to eat. It just makes sense. It also turns out that hormones coordinate hunger, fullness, and digestion of food. So eating on someone else’s clock doesn’t make too much sense. Two hormones in particular are predictable and determine what happens with the food you eat: insulin and cortisol. Insulin starts low when you awake and rises when you eat. Cortisol inversely starts high in the morning and drops as you fall asleep. Insulin is released when there is lots of glucose in the blood. When you eat carbs, insulin comes. Insulin is the signal for your body to take glucose out of your bloodstream into your cells. Liver, muscles, and fat cells take in glucose when you eat because insulin commands it. It’s important that your body can release insulin when you eat a meal. This ensures that the glucose in your blood gets absorbed by your body. Too much glucose floating around in the blood, and you have high blood sugar. This happens when you eat and there isn’t enough insulin released to take in all the glucose. Cortisol counteracts insulin. Since cortisol is highest in the morning, insulin will be least effective in the morning. It makes sense to avoid eating until later in the day, when cortisol drops and insulin response can be more effective. In this way, your body has a system and timing for food absorption. Play around with timing your first meal. Try skipping breakfast. Try a later lunch. Delaying your first meal will give your body a chance to absorb the food better. Cortisol won’t be so high. Insulin will be released more effectively, ensuring the glucose from your food gets properly absorbed from your bloodstream. Use fatty foods to regulate hunger when you do eat. Fat satiates hunger much better than starches, and tells your body to burn fat. Skip the fat and you’re going to have cravings all day long. Imagine how strenuous exercise can complicate matters for you. Your energy needs will drastically change. Your body will need more building blocks, more vitamins, more minerals, and different timing of meals. It’s all doable, and I support your decision to become stronger through exercise. But before you toss yourself into the algorithms of traumatic exercise recovery, figure out your practice of food and eating for your current state. Eat lots of healthy fats, until you are full and satisfied. If you have cravings or feel hungry after meals, try eating more fat. Photo credit daBinsi/Flickr. Posted under this Creative Commons license. I know it’s been too long since I’ve written to you. I’ve been traveling and figuring things out lately, and haven’t sat down to write in a while. There’s lots I want to share with you. Here are several things I’ve been pondering, developing, and talking about with people around me. Most of them you’ve seen from my blog before, but wellness is never a one-time deal for me. Being healthy is about practice, trying, developing, and building layers. These items mostly came out of traveling and being “on the road”, meaning no gym, no permanent home, limited resources for training and cooking. I hope you find this useful, whether or not you’re traveling. After all, I started a lot of these things while working in a corporate office and living in Los Angeles. So it’s all transferable. Here they are. There’s a book I love called The Wisdom of No Escape and the Path of Loving Kindness, by Pema Chodron. It’s about the wisdom in accepting your circumstances, loving yourself, and not rebelling against who you are. The book is written by a Buddhist teacher, mostly for people seeking the philosophy and technique behind Zen meditation. I read this in college, and the book has carried over to all other aspects of my life. Including physical training. One of the biggest downfalls of the fitness industry is that consumers are not encouraged to take things slow, to work on themselves gently, and to train for the long game. Trainers, coaches, supplement companies, and magazines are full of the notion that the body has to be broken to become better. It’s your body. You don’t have to break it, or suffer, to become stronger. That’s not how things work. In the short run, you might get big muscles, snaky veins, and a six pack. I understand the need to have these things. It’s been pounded into our psyches by mass media, and it’s part of our primordial urge to be fit. But what about the long run? Will you be well, functional, pain free, and freely moving years, decades down the road? Do you care? There is a way to be strong and to remain strong for the long game. And that way involves gentleness. It requires you to learn about your body in every possible way as you develop your wellness. Be gentle with your eating. Be gentle with your body, your moving, your training. Be gentle with your mind. This comes into play when you realize that you are not going to get some specific result immediately. Eating a salad today won’t make you skinny, lean, and virile tomorrow. And it doesn’t help to eliminate fats, proteins, and carbs from your diet. See how going rough leads you into a downward spiral? Step back, make gentle pushes, observe results. Test yourself, but don’t break yourself. The object of the game is to grow, to learn, to be healthy, happy, and capable. Feet have a structure and function that work only when they are unhindered. You have the ability to redevelop your foot structure, the right stance, the right walk, and the right movement patterns. It starts with taking off your shoes. Go barefoot at home, around the hood, and wherever you can in the outdoors. It’s just one of those things that gets easier the more you do it. So start tiny. We will see many products hit the “barefoot” market. Shoes, sandals, socks, sports equipment, and hopefully even transportation that lets us be close to barefoot all day long. I think this is progress. However, these products do not make you barefoot. Simply using your bare feet is different. Barefoot cannot be replicated. A “barefoot running shoe” is not barefoot. It is a shoe. Train barefoot. Do strength training without shoes or socks. You can do them all if you start from zero, go gently, and progress responsibly. I have done deadlifts, squats, kettlebell, and body weight exercises barefoot. Orthopedic insoles did not help me. I had prescription plastic insoles for most of my adolescent years, into college. The pain of walking, running, and standing in shoes went away like magic. But guess what the price was? My feet got flatter and weaker, more prone to strains, and less and less able to hold me up the way they are supposed to. Then I started following Kelly Starrett, and shed the insole supports. I wore flat shoes instead. Then I wore huaraches. But nothing beat walking barefoot outside, running barefoot on the grass and sand, and lifting barefoot at the gym. These activities, over three years, rebuilt the shape and mechanism of my feet. I now have arches. So this is where I would link you to a product that I used, but I can’t because there is no product. You just simply need to take off your shoes and socks. However, there is technique that you need to use for proper development. Just like with all other parts of your body, such as your knees, your back, and your shoulders, for example, feet have a correct position and movement pattern. Place your weight on the parts that are meant to hold weight: the sole, the outer blade, the balls of your feet, and the toes. You’ll see that your arch, or insole if you don’t yet have an arch, doesn’t have to touch the ground. You’ll feel that springiness in your step. Walking, running, jumping. Try them all barefoot. Figure it out and rebuild yourself from the ground up. If you need coaching, I can help. From five years of self experimentation, drinking butter coffee almost every morning, traveling and eating for optimal energy, and talking with others experimenting with eating more fat, I continue to find that “fat first” works. This means eating fat for the first meal of the day, whether that be in the morning or afternoon or night. It means eating fat before eating other foods during any meal, or at least at the same time. Try grass fed butter melted into rice. And “fat first” means making sure to eat good fats, from good sources. Why? Because fat is filling, fat is the building block of cell membranes and your nervous system and your brain, and fat gives you energy. Eating good fat from healthy animals ensures that you get the nutrition your body and brain needs before you fill up on other things like starch. Eating fat first means you get satisfaction and feel fuller from it. It helps guide me in my meals, because as long as I eat good fats I know how much of other stuff to eat. I feel more balanced in my urge to eat rice, veggies, and meat when I am eating good fats. Don’t think I don’t eat carbs. I eat lots of carbs, because I need it for my body composition, level of training, and daily activity. But my eating is moderated by the fat I’m eating. I guess I can say that fat is my primary source of satiety and energy, and my starting point for measuring hunger and portions. Here’s an example of how fat is my nutrition measuring tool: if I feel the munchies, cravings, or urge to eat dessert at night, despite having eaten dinner, I’ll rewind through the day to see how much fat I’ve eaten. Most times, I’ll realize I forgot to mix butter into my rice, or didn’t have my usual butter coffee, or didn’t get the chance to eat any good quality fat that day. If I can, I slap a slab of grass fed cow butter onto some sweet potato and have at it. Fat first. I am fascinated by kids who are allowed to develop physically without the restraints of bulky sneakers, cribs, seats, and overprotection. My friend lets his son walk, run, roam, climb, and play more than most parents I’ve seen. He also lets him do this barefoot, even outside. When shoes are necessary, they are soft, flat on the bottom, and flexible enough for the feet to do their natural job. The result is incredible. My friend’s son is a dense-bodied mover, and he is able to hold his core rigid when he’s lifted off the ground, flipped overhead, and swung back down. He holds perfect spine alignment as he deadlifts a suitcase off the floor. This beloved mini-athlete sometimes gets into a yogic child pose, stretches out on his belly, and lifts his arms and legs off the floor in a reverse plank. It’s all play to him. And he’s barely a year and a half old. I laugh and marvel at his feats of mobility and strength. At the same time, I feel excited about what this little kid represents. He shows me it’s possible to have a perfect squat as natural and easy as yawning. He proves to me that movements like the deadlift and positions like straight feet and straight spine in the squat are natural. It gives me an example to follow. Since the kid hasn’t been molded into cushy shoes, and since he hasn’t been confined to classroom chairs, his movements are intact. He pushes his limits all the time in the weight of the bins he lifts, the suitcases he pushes, and the stairs he climbs. Doing these things is challenging in themselves, but doing them with minimal risk of injury and optimal strength is natural only because limitations are not yet put on our little friend. So what if you’re starting today, having already gone through the body-morphing gauntlet of “civilization”? You’re not alone. Modern life’s walls came up, boxed you into the appropriate shapes, and contracted your physical and spiritual expressions into the norms of the day. It’s not about being a kid, or about glorifying childhood or youthfulness. No. Just look at the human form in its beginning stages, and you can find movement and position as it was meant to be. You can train your malleable body to obtain the strength, movement, and positions of human expression. The full squat, the unhindered overhead arms, the use of joint torque, and spine alignment are all obtainable with training and practice. Possessing natural physical expression and the strength to maintain it will free your mind and soul to build toward your greatest goals. Have I told you about butter coffee? Creamy, smooth, and delicious, it gives me immense energy and focus. I first started having this concoction with breakfast, and found that it helped me in strength training. Eventually, I just had more butter with it and didn’t eat breakfast at all. I now go the entire day without any other meal, until dinner. When I drink this concoction, I get mental clarity, sustained focus, and a predator state of mind and body that is unparalleled by energy from any other food. If I haven’t made it for you already, I’ll show you how so you can experience it for yourself. At first, your body will need to learn to effectively absorb nutrition from fat. This takes several days to weeks for some people, especially if you are not in the habit of eating a lot of fat. Most self-described healthy eaters do not eat much fat. Keep your regular meals at first and just have this coffee with breakfast or an hour before training. You want to feel it out and do what works best for you. The quality of your ingredients lends to the flavor, level of energy, and creativity you will get from your cup. Single source coffee beans are grown, harvested, and processed on one estate or farm. All other beans, sometimes called blends, are mixtures of beans from two or more estates. Single source beans come without the added time of storage and transportation. Coffee is vulnerable to mycotoxins, which can cause headaches and jitters. Mycotoxins are inevitable, but through good practice and minimal exposure to the environment they can be suppressed. The less time from harvest to your cup the better. I didn’t know how much of a difference this would make until I gave single source coffee a try. I noticed significantly better results. Even when I was tired, I had calm mental clarity from it, not just a jittery buzz. No crash in energy, and no headache. Now I always look for coffee that lets me be even-keeled and fierce. There are two types I drink primarily, but you can find others if you look for them. I found a great tasting single origin coffee in a local store. I really enjoyed the flavor of this light roast. It was from Alto Mayo Estate, a single coffee farm in a mountain region of Peru. The coffee smelled amazing, roasty and smooth. I had great results from this coffee every day, feeling clear minded, focused, and strong when I drank it. If you have a quality grocery store nearby, find a single source coffee with the roast intensity that you enjoy most. The key to finding good coffee anywhere is to verify that it says “single origin”,”single source”, or”single estate”. I don’t pay attention to the phrases Fair Trade, Shade Grown, and Certified Organic. While they do hold social value, they also warrant a higher price tag. Whatever you choose to buy, drink it and test it yourself for absolutely positive symptoms. Do not assume it’s good based on the label or the price. The whole point is to find something that allows you to accomplish greatness. With that being said, some blends may be okay if they are from the same roaster. If you know the beans are roasted at the same facility and are blended there, they may be as good as single source. But again, try the coffee and make sure it brings you mental clarity and sustained focus. Grass fed cow butter is the key to creating the smooth frothiness of your concoction. It’s important that the butter is from grass fed cows. Cows that are 100% or almost completely fed on grass are healthier and happier beasts. Butter from such beasts makes me a happier beast. The ultra nutritious elements like healthy saturated fat, CLA, omega-3 fat, butyric acid, vitamin K2, vitamin E, and beta carotene are elevated in cows that eat grass only. There are two types I tried, and both are excellent. The most reliable brand that I get from Trader Joe’s or Whole Foods is Kerrygold Unsalted Butter. It’s an awesome Irish butter that comes in one-cup bars. If you don’t have a store nearby, you can get in online. It’s a little more than the store price, but it is worth it if you can’t get it anywhere else. I get a box of 20 at a time and stock them in my freezer. My other go-to butter is harder to find on the west coast of the U.S., but it can be found in some other countries more easily. I love Anchor Unsalted Butter from New Zealand grass fed cows. On a recent trip to Asia I was stoked to find Anchor butter from a Jakarta store. I had never used it before, but it was surprisingly good in my coffee. The subtle flavor and smooth texture pair well with the cacao and vanilla I use. MCT turns the light switch on in my head. Medium chain triglycerides (MCTs) are fatty acid chains of 8 and 10 carbons in length. C-8 and C-10 fats absorb through the gut into the bloodstream to the brain fast, where they can be utilized as energy in the form of ketones. Ketones have been found in research to be more efficient brain fuel than glucose, and I feel the difference. When my brain has this fuel source, I have more clarity, better mental function, longer sustained focus, and no crash. It also brings my body into a fat-burning mode. This has been shown to help regulate body weight, and it’s certainly proven true for me. MCT oil is usually derived from coconut and palm kernel oil, and there can be a very slight coconut scent to it. There are several different brands out there, and the quality of the MCT oil is determined by purification and processing. Purification affects the concentration of C-8 and C-10 versus other types of fat that are not MCT. Processing includes how the coconuts are stored and pressed, and where they are from. My go-to bottle is BULLETPROOF® Upgraded Brain Octane Oil. It is the most concentrated version of MCT oil out there. It consists only of C-8 fatty acids. NOTE: This fuel is intense! I recommend using the regular MCT oil first. It will help to make a smoother transition to this different energy source. Bulletproof XCT Oil I used to have this regularly in my coffee before I tried Brain Octane oil. It has both C-8 and C-10 fatty acids. This is a good starting point if you haven’t tried MCT oil. It isn’t as intense as Brain Octane, and I think it would be the best choice for learning the effects of MCT oil on yourself before venturing into the more intense version. Flavor is slightly more coconuty than the following Viva Labs oil that I also have used. This is a very clean product that I can rely on for top performance. Viva Labs Non-GMO, Gluten Free MCT Coconut Oil, 32 fl oz A great quality MCT oil I’ve been using, with great results. Tastes clean, no bitterness, light coconut fragrance. I have used high quality coconut oil before in my coffee, when I ran out of MCT oil. Coconut oil will add a lot of flavor, but in my opinion it’s overbearing. Also, it is not a sufficient substitute for MCT oil. There is only a very small percentage of C-8 and C-10 fats in coconut oil, contrary to common belief. The majority of advertised “MCT” oil here is C-12, which actually does not act like the shorter chains in energy utilization. With that being said, if this is your only source of MCT, it will still provide you with some benefits of fat-based brain energy. And I’ve talked to some friends who really love it. Plus it’s delicious for cooking chicken curry dishes. Maybe I’ll post on that later. If you’re getting all of your MCT from coconut oil, use four tbsp or more. 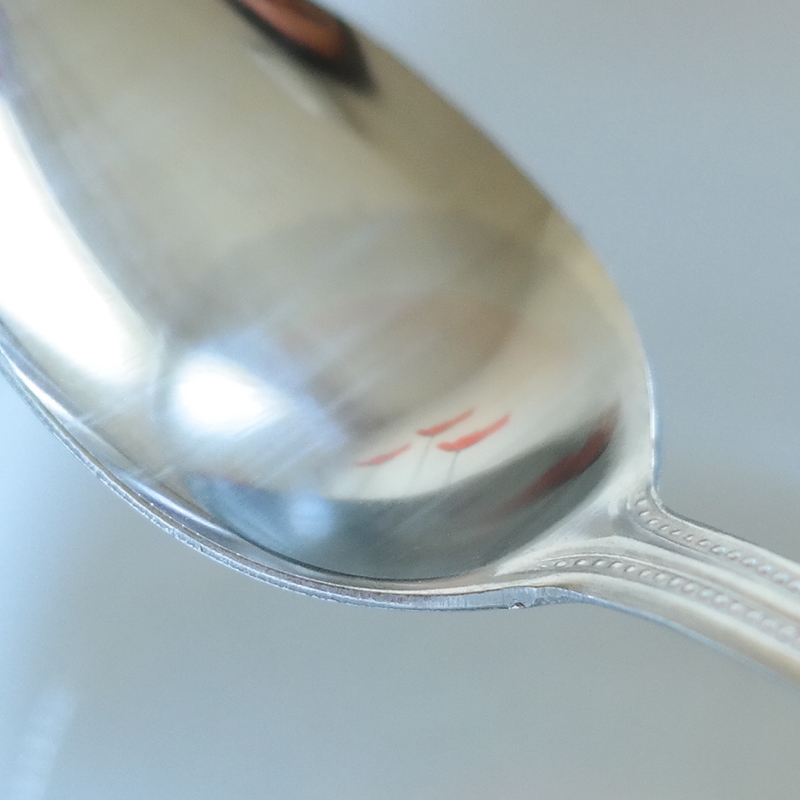 As a flavor or C-12 supplement, use one or two tbsp. These next few ingredients are what make my butter coffee taste so good, compared to ones you find here and there in shops and cafes. I add these elements every time I make my concoctions, and have had the most amazing conversations with friends, breakthroughs in strength training, and mental performance after having it. This is my favorite hack for butter coffee. Vanilla bean has amazing flavor and also has flavonoids that enhance creativity. I add this without fail to my coffee concoction every morning. Check out the BULLETPROOF® Upgraded Vanilla I use, which is an heirloom Madagascar vanilla bean. It has an unforgettable cherry wood fragrance and takes my mornings to the next level. I use about 1/16 of a teaspoon. Keep it sealed in the freezer for maximum flavor retention. Second only to vanilla bean, cacao butter is another flavor and nutrient must-have for me. It’s the pure fat of cacao beans and this is what they use to make white chocolate. Cacao butter gives a rich, gourmet scent and flavor to the coffee. It has the concentrated elements of chocolate that enhance your creativity and brain power. The one I use every morning is BULLETPROOF® Upgraded Cacao Butter, hand harvested from a single source in South America. I add chocolate powder to my butter coffee to make it rich and dark. Good chocolate, like good coffee, has flavonoids and antioxidants that enhance brain and performance. Gauge the flavor, it can be rich and quite bitter. Start with about a teaspoon or less. BULLETPROOF® Upgraded Chocolate Powder This one pictured above is from heirloom cacao beans. Viva Labs – The BEST Tasting Certified Organic Cacao Powder, 1 LB This is the pure cacao powder I’m using right now. Has a mellow profile without the bitterness of other pure chocolates. My coffee has no sweetener, but my wife likes hers a bit sweet. This stuff of nature is the perfect solution if you want to be in ketosis yet want that rich sweetness in your coffee. This will not trigger your insulin response, unlike sugar. And it tastes naturally sweet, unlike stevia. Xyla North American Hardwood Xylitol. The best type, pictured here, is made from North American birch trees. The cheaper brands are made from Chinese GMO corn. I recommend using one to two teaspoons per cup to start. It has about the same sweetness as regular cane sugar. These ingredients can be added as needed for the different types of activities you do on any given day. Add these one at a time and observe whether you benefit from them. Collagen is one of the building block of your tendons, skin, and hair. It is needed for repair of tissue after training, and makes your skin more vibrant when you provide yourself with enough. Unlike whey protein, which caused gas and bloating, collagen has been problem-free for my digestion. For these reasons it is great for strength training, tissue repair, and skin and hair boost. BULLETPROOF® Upgraded Collagen Protein Super fine-grade and from grass fed cows. It’s processed with enzymes rather than heat, which prevents damage of the proteins. I generally only add collagen on the day of, and up to three days after, a training session. Bulksupplements Pure Hydrolyzed Collagen (Bovine) Powder (1 Kilogram) This is the product I am currently using. There’s no bad flavor and the granularity is nearly the same as BULLETPROOF®, although not as fine. However! This brand is not from grass fed cows. The reason grass fed cow food is important is the fat. Since collagen isn’t fat, I’m taking a temporary risk because it’s cheaper. I’m currently rebuilding joint and muscle tissue, and haven’t noticed any signs of bad nutrition. So far so good. But I do believe that grass fed cows are fundamentally different from grain fed feedlot cows, so eventually I aim to only eat food from grass fed beeves. 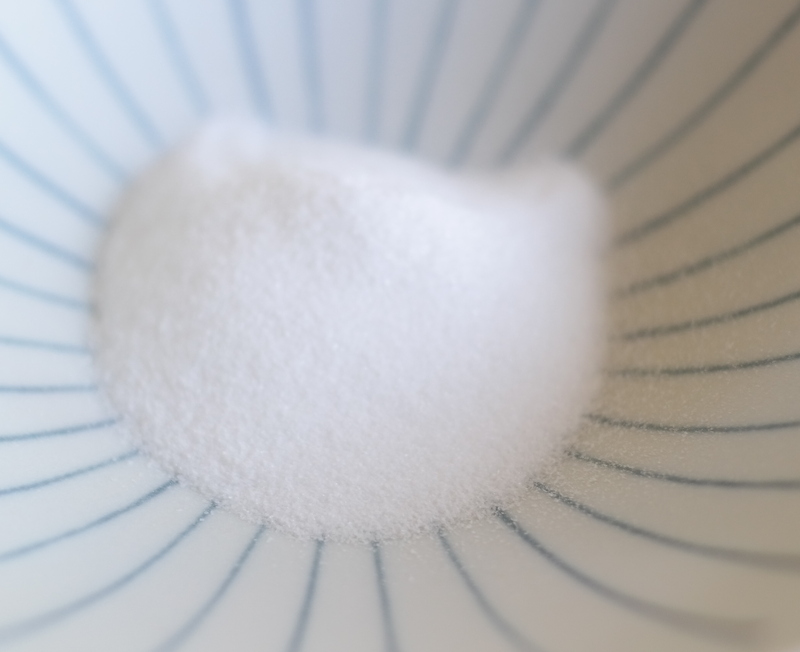 Collagen does make me hungry after about four hours, which causes a slight decrease in focus. This is because protein triggers an insulin response. With protein, you will get similar, but not as drastic, effects as when you eat carbs. After strength training, this isn’t a problem, since I will eat anyways. But on normal days without training, I forgo the protein in the morning. My wife, on the other hand, has it every morning in her butter coffee. She simply feels better and more energetic with some protein. Use at least one tablespoon. I add a baseline dose of creatine every morning with my coffee. Without causing huge swelling of muscles, this simple nutrient has allowed me to maintain strength and muscle mass for longer periods of time between training sessions. It is one of the key supplements I use to increase longevity of strength. Creatine also boost brain function. Now Foods creatine monohydrate This brand has been my go to for years. No side effects, suggesting it is clean and pure. Use 1 teaspoon or 5 grams daily. I’m laying this recipe out for first time dabblers in butter coffee. The way you make your coffee will affect how it feels, tastes, and energizes. Even for more veteran practitioners, small hacks can give you a better concoction. To have delicious butter coffee it must be three things: Hot, well-brewed, and well-blended. How you set up the ingredients and the order in which you prepare it can be the difference between a floating oil slick and a creamy concoction of joy. Start a kettle on the stove before anything else, as you will need time to prepare the other ingredients and want the water hot when you’re ready to brew. If you’re using a normal coffee maker, get it all set up with beans and start brewing. Use spring or well water for the best flavor. Water has as much flavor and texture as any other ingredient that goes into coffee. Make your coffee with tap water and you’ll taste the tap. For the Pour Over technique, prepare about a quarter cup more water than the amount of coffee you plan to make. Note: The stronger the blender, the finer the foam. You can get an incredibly smooth concoction with the VitaMix Blender. You can brew your coffee however you choose. If all you have is the classic coffee maker, just use that for now. My all time favorite method of coffee brewing is the Pour Over technique. Coffee tastes the best when I make it this way, but a close second is the French press, and honestly after that it’s just the normal coffee maker. The pour over technique requires a kettle with a thin pouring spout, as well as a filter cup and filters. 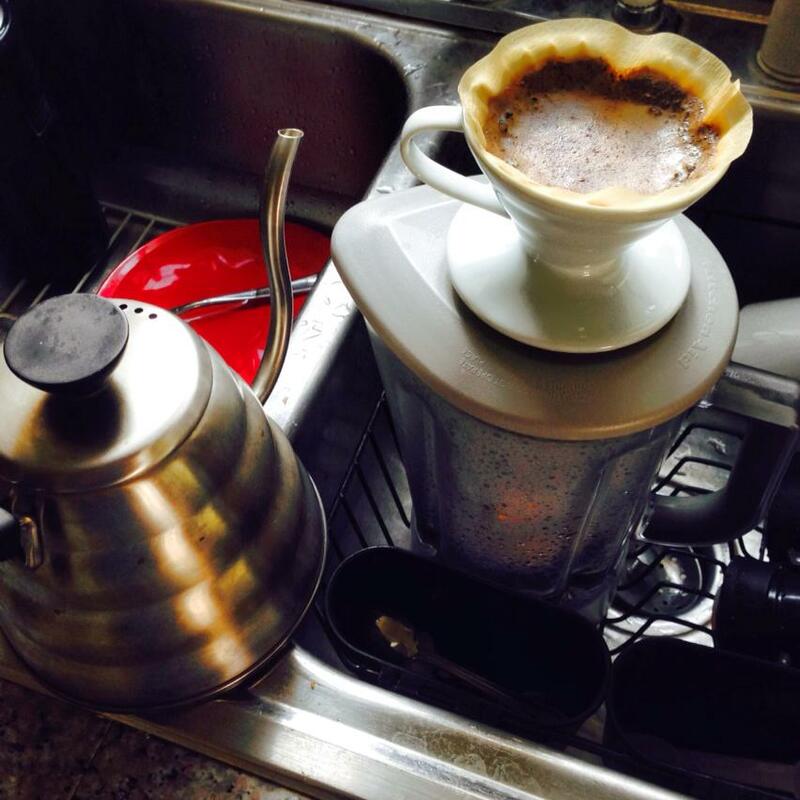 Here is how I brew pour over. Boil water in the dripper kettle and turn off heat. 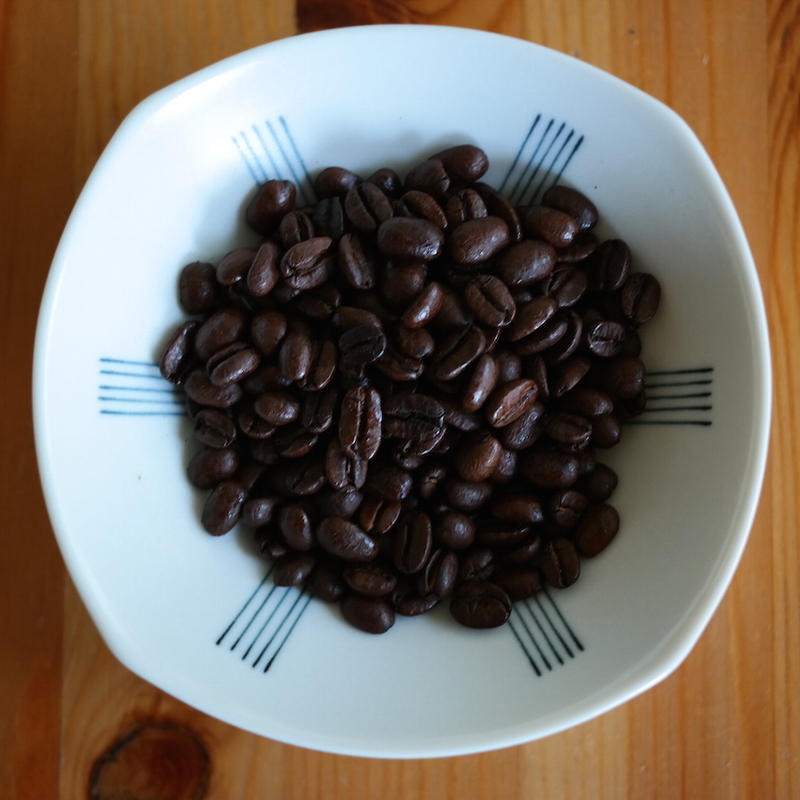 Grind coffee beans to slightly finer than medium granularity. Any finer and it will take forever to brew and you will get too much acid. This is how fine you want your grounds for pour over brewing: You can use an electric grinder like the one I have above or a hand grinder if you want to have more evenly ground beans. This takes a lot more time and effort though. Fold the crimped edge of a paper filter, open up the filter, and place into the ceramic cup. Wet the filter paper by pouring just enough hot water along the edges of the cup. This gets rid of the flavor of the paper. 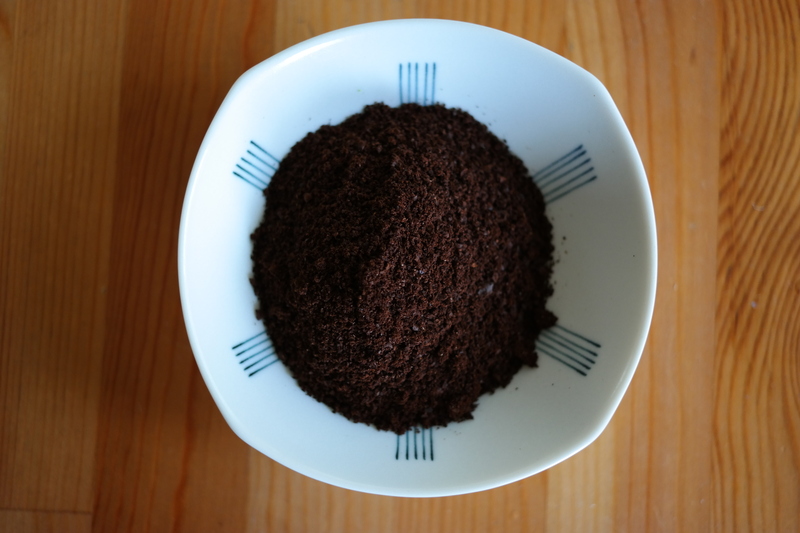 Dump the ground coffee into the filter paper. Starting from the center of the cup, slowly pour water in an outward spiral until you cover all the beans with water. The grounds will start to breathe and expand. Let the gas escape and as the grounds deflate, continue to pour in the same spiral manner until you have poured all the water. The pouring should take about 3-4 minutes total. 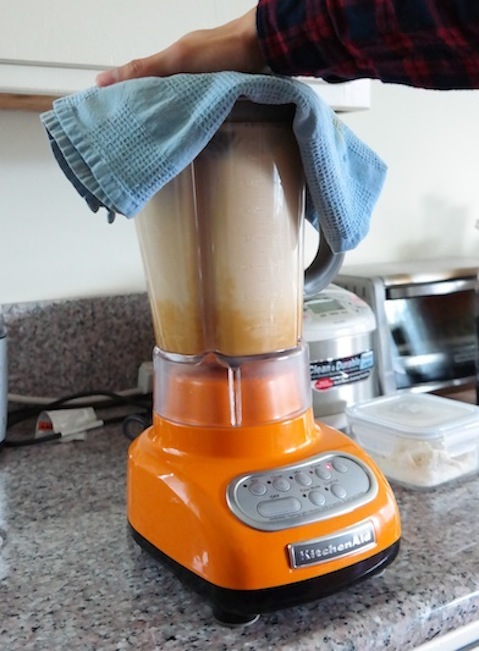 Once the coffee is brewed and in your blender with the other ingredients, place the lid on securely and cover the top with a dish towel. Hold down the towel over the lid tight while you blend it on the highest setting for 20 seconds. 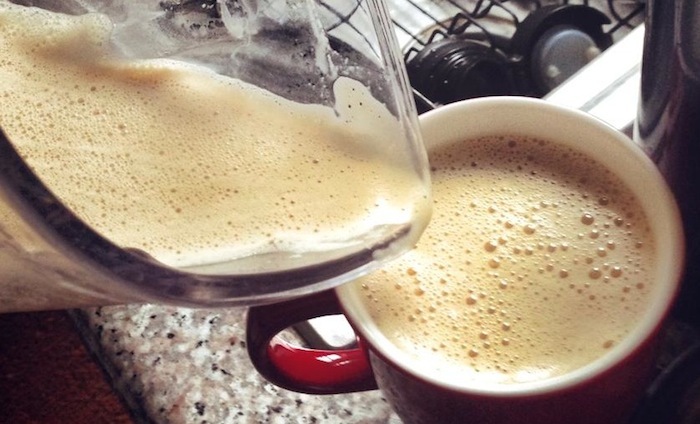 Depending on the quality of your blender, the coffee may punish you if you don’t hold it down. Keep the rest in a thermos and drink it through the morning. These are my two favorite containers for coffee. 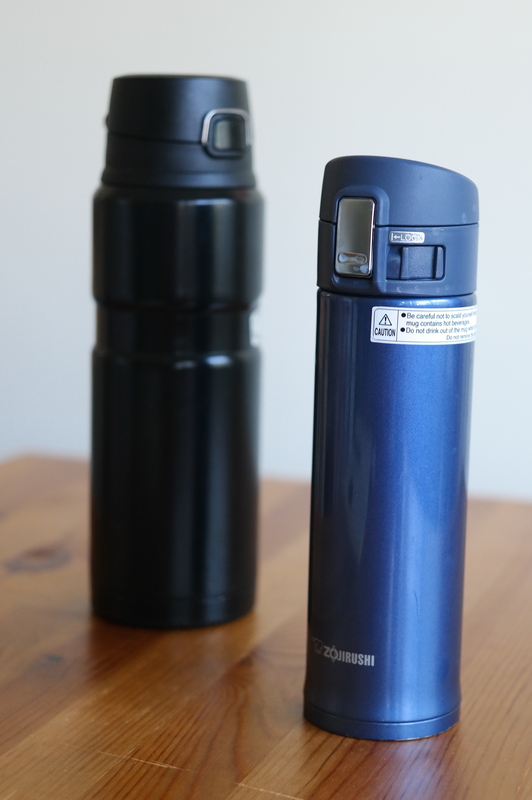 The Thermos is larger and holds a full two cups of coffee, fairly hot through the day. The Zojirushi is smaller but keeps coffee radioactive hot the entire day. Up the dosage on the butter and MCT oil slightly after a week or two, if you can glean the benefits without having the runs. You can always lower amounts the next time if you don’t feel as good of an effect. Don’t change the MCT dosage drastically. Try increasing by a teaspoon each week, making sure to observe the quality of focus. You don’t want to end up dizzy or give yourself digestive issues by taking too much in the beginning. 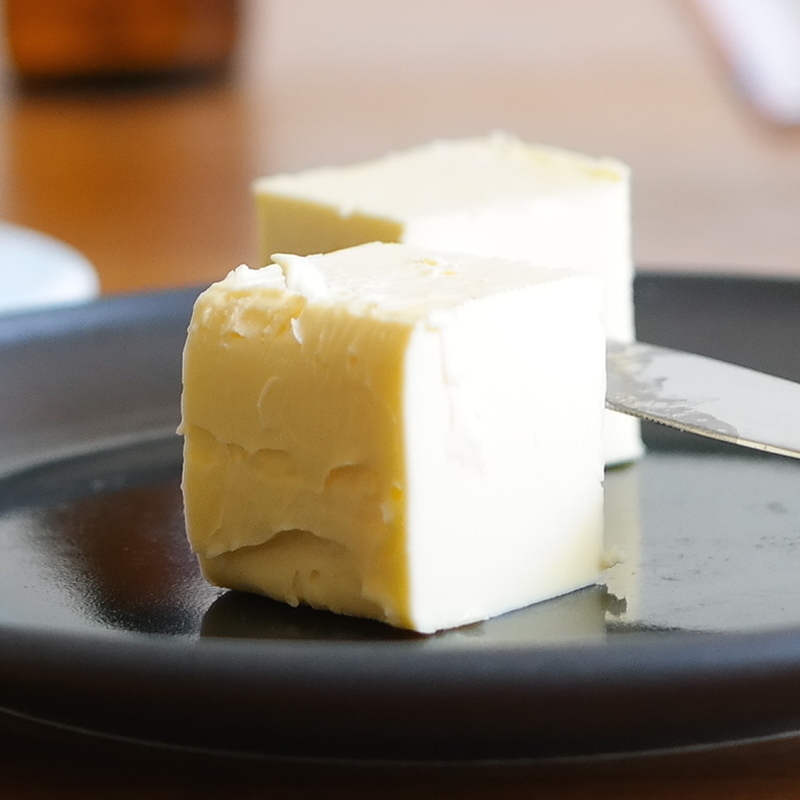 If you’re hungrier, add more butter. Try increments of one tablespoon. Use the minimum effective dose. That is it. Try it in the morning, about an hour before a training session, or before any task that will take a lot of brain or body power. You’ll be restless the first few times if you don’t have a world or two to save. I had butter coffee as fuel for a 370 lb. squat and 391 lb. deadlift at my first powerlifting meet, a 5k in under 23 minutes with no training, and the LA Downtown Ketchum Stair Climb, which was a stair climb to the top of a 76-story skyscraper, in 19 minutes. These are not Olympic numbers, but I did all this without needing tons of protein or carbs immediately before or after. I hope you find that reasonable amounts of healthy fat as a source of energy puts you on a different level from just pounding protein and carbs. Let me know in the comments if you try this and how it goes for you! If I’ve made this concoction for you before, let others know how it tasted what it felt like to drink it. I think a lot of people are curious about what butter in coffee would be like, and they will be surprised by how good it can be if done right. I am an affiliate of the BULLETPROOF® site and earn a fee from any purchase there made through my site. Copyright © 2016 Steve Ko, All rights reserved. Photos and articles are created by me, unless otherwise stated and credited.